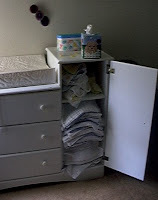 Home Diapering Diapering_: Where do you store it all? Diapering_: Where do you store it all? Thanks to Rachel for this Frugal Baby Tip! Basically, we have a dresser with a "locker" attached, the locker is higher than the dresser. So on top of the dresser, we have a contoured changing pad. On top of the locker, I have a Wipe Warmer with water & castille soap and a box of tissues. In the locker there are 3 shelves - top is for my fitted diapers, and soakers are in the back (need to be re-lanolized). Middle shelf is for my prefold diapers (I can stack 3 dozen in there). Bottom shelf has my 2 dozen newborn prefolds, and my "icky" prefolds that I use for doublers. Beneath the window I have 2 diaper pails - a Sterilite for wets and a Diaper Champ for poopies. Next to the window I have a white wire thing from the Container Store for pantries. I use it to store my washcloth-wipes, my lotions/extra Snappis, covers, and my liners for the changing pad. I have a hook above the changing table for a windchime, and I use that for air-drying covers. But I want more hooks. See more pictures and ideas for diapering set-up!